Dr. Phillips is a beautiful suburb in Orlando, Fl. In 2010, the population was extremely low at 10,981. The area inherited its name from a most respectful Dr. Phillips, who was not only a doctor of medicine but was also known as a citrus magnate in Central Florida. At one point in history, he was acknowledged as being the largest citrus grower in the entire world. Over the years, he accumulated thousands of acres of citrus groves. He harvested grapefruits, tangerines and various types of oranges and it was he who introduced new ideas for the processing and packaging of his liquid gold product, orange juice. His numerous parcels of land cut through nine counties in Central Florida. His coveted land line began at Conroy Road on the north, to the very south end of the Sand Lake Chain. A land survey showed that his beloved citrus groves also claimed all the land volume of Bay Hill, Orange Tree, Sand Lake Hills and Turkey Lake Park. To better improve the products of his citrus groves, Doc Phillips built a fertilizer plant right next to his modern packing house, producing most important fertilizers for the betterment of the crops. He was a humanitarian at heart and he built housing for his citrus workers and eventually a new post office adjacent to the train station which served the area. Dr. Phillip Phillips played an enormous role in the innovation and creation of the community, rightly named after him. The community is now home to 40,000 residents who work, live and relax in one of the most luxurious and high-end residential areas in Orange County. The scenic and sandy shores of the famous Butler Chain of Lakes, Little Sand Lake and Sand Lake are aligned with exquisite and executive custom-built homes. The community of Dr. Phillips is one of the most superb and wonderful areas ever to be found from the Panhandle to the Keys. Incorporated into the community are two great golf courses accompanied by their individual and elaborate country clubs. More often than not, the subdivisions in Dr. Phillips are gated communities, providing safety and exclusivity to the residents within. A gentle blend of country atmosphere comingles delicately with the trappings of the metropolitan area of Orlando, thereby providing a well balanced way of life. Due to the proximity of everything that Central Florida has to offer, the residents of Dr. Phillips want for nothing. From the bright lights of city life, to well known restaurants, high-end shopping venues, theaters and Disney theme parks, all these hot spots are within arm’s reach. Parents find that raising families in Dr. Phillips has its advantages. The community’s crime rate is astonishingly low, neighbors are friendly and care for one another and best of all the school system is outstanding. The common areas are punctuated with community pools, scenic parks and playgrounds which promote fun, exercise and good health. Many residents feel very relaxed living in this well rounded community and are thankful they have such a wonderful place to live. Dr. Phillip Phillips was deeply involved in a variety of charitable organizations, many of which still carry his name even to this day. Born on Jan 27, 1874 in Memphis, Tennessee, he eventually attended the Columbia University and was ultimately awarded a medical degree. When he was a young man of 20, he purchased his very first orange grove in Satsuma. In early 1895 an extremely destructive deep freeze struck Florida and demolished thousands of citrus trees, including his precious orange grove. Demoralized and down trodden, he headed back home to Tennessee, but later returned to the southern region of Central Florida in 1897. Once again, he purchased more land in Osceola County, 5,000 plus acres of citrus groves and two very much needed packing houses where he put his earlier innovations into play. 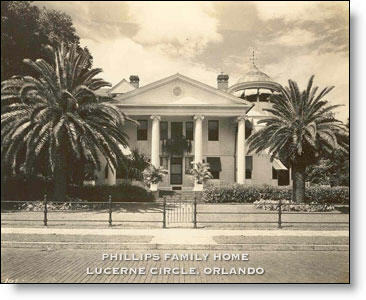 His wealth increased and in 1905 Dr. Phillips purchased another grove on the south side of Sand Lake in Orange County. He never gave up on the medical aspect of his life and many years later, the land upon which his orange grove stood, became the home of a much needed community hospital called Orlando Regional Sand Lake Hospital. In 2006 the hospital was renamed The Dr. P. Phillips Hospital in honor of the good Doc. Today it’s a full-service medical/surgical facility. The residents of Southwest Orange County and Orlando’s growing tourist population have a place to go to when medical emergencies rise. Dr. P. Phillips Hospital is rightfully equipped with the latest technology in cardiovascular catheterization, angiography and diagnostic imaging, as well as a full support staff, qualified and caring nurses and physicians. The emergency department is a state-of-the-art facility, where a strong support staff handles the many emergencies that come through their doors. In the late 1940’s, Doc imagined the creation of a community, with the grove operations being at the heart of the community. He later hired a developer to produce a blueprint of his dream community where people could work, live and play. Originally, his village would hold around 5,000, and it included residential, commercial and industrial development, focusing on agricultural enterprises involving the processing and marketing of citrus and the many other products that come from them. After World War II, unionization hit the citrus industry and Doc brilliantly switched horses in the middle of the race. In 1954, he sold off all his citrus holdings to a partnership which included Minute Maid. They withheld their many acres of undeveloped land in the southwest of Orange County, and eventually sold much of it to developers who built residential neighborhoods in the surrounding community. Some of these new neighborhoods included amenities that today’s residents enjoy; golf, tennis, swimming and boating. Later, in the late 1960’s, Walt Disney announced its grandiose plans to build Walt Disney World in the area. This is when Dr. Phillips son, Howard Phillips, realized that his father’s original plan had to be improved and updated in order to benefit and accommodate the community itself. In time, a master plan for an 18-square mile area was developed and the Dr. Phillips community won the honor of being the first master-planned community in Central Florida. Downtown is home to many shops, professional offices and multiple family housing structures. Single family residences begin where these downtown infrastructures end. The plans included a major provision for education, and today’s community boasts seven such schools, elementary, middle and high. Prior to the plan being completed, Dr. Phillips Charities built the fire station, built and operated a water plant, and in turn, established a water and sewer system. A library was also included to the mix, for the benefit of the new community. Dr. Phillips, his family and his charitable organizations thought of everything that this great community would need in order to grow and thrive. Working closely together to turn his humanitarian dreams and goals into a reality, their accomplishments live on and will continue to do so for many years to come.